The ratio call spread is an option trading strategy that is used when the trader believes that the price action in the underlying market will remain within a range that is at or above it's current position, but won't go too far north before option expiration date. It is part of the ratio spread family of positions because there is a disparity between the number of calls bought and sold, to make up the spread. The ratio can vary depending on the implied volatility in the option strikes and may include combinations such as 1:2, 2:3 or 2:5. The main idea is to enter the position at zero cost or even a small credit. Since the position is usually put on at even money, the downside risk is generally zero, so the trader looks to realize a profit from low price volatility as the underlying meanders north as option expiration date approaches. The downside of this strategy is, that once the underlying breaches the northern breakeven point, the potential loss is unlimited. The profit potential on the other hand, is limited. This is because you have sold more calls than you purchased and the point will come where their liability will outclass the value of the bought calls. The maximum profit at expiration will be limited to the strike price of the OTM short calls, minus the strike price of the ITM long call, plus the net premium received (if any), less commissions. If a credit is received upon entering the position, the trader will make a small profit if the underlying falls or remains neutral until expiration. For this reason, ratio call spreads are ideal setups when you believe that the underlying has exhausted an upward trend and is unlikely to continue much further. Momentum indicators such as the RSI can be very useful in identifying these conditions. Let's imagine that a particular stock is trading at $43 in September. We believe that by October expiration date, the stock price will not travel much farther north, so we execute a ratio call spread strategy by buying one ITM October $40 call and selling two OTM October $45 calls. We do this for even money. At expiration date, the stock is trading at $45. At this point, the October 45 calls expire worthless while the $40 call expires in the money and realizes a profit. However, if at expiration date the stock price has advanced to $50 then all options positions will expire in the money. The trader now faces two $45 calls that are $5 in the money each and one $40 call which is $10 in the money. At this point, the trader breaks even. But let's say there was some unexpected good news for the company and the stock price shot to $60 by expiration date. Now we have a problem. The 2 sold $45 calls are $15 in the money while the one bought call is $20 ITM. So we are facing 15 x 2 = $30 liability vs $20 asset = $10 loss on the position, times the number of underlying shares covered by the option contract. The above scenarios are depicted in the risk graph below. 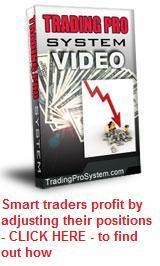 We can see how beyond a certain point, this strategy is liable for potentially unlimited loss. For this reason, I would prefer to use this strategy on Exchange Traded Funds options rather than individual company stock options, unless you are certain that nothing is likely to cause an unexpected spike in price. 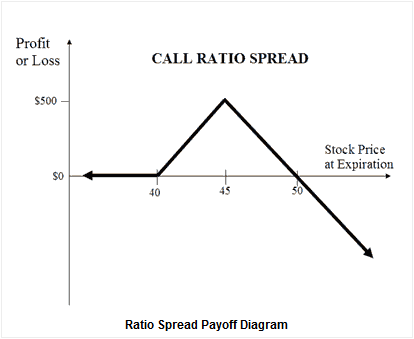 The ratio call spread should not be confused with the call ratio backspread. Backspreads are used when future price volatility is expected while ratio spreads are executed in neutral market conditions.